MitoScore is a mitochondrial biomarker which gives us an indicator of the energy status of an embryo. It allows us to select those embryos with the greatest probabilities for implantation. It increases the possibilities to result in a viable pregnancy through IVF/ PGS. - Mitochondria are structures within cells that play an essential role in energy production. - Most DNA is located in chromosomes within the nucleus, but mitochondria have their own DNA. This genetic material is known as mitochondrial DNA or mtDNA. - mtDNA in an embryo is an index of energetic stress, which can be used to predict its implantation potential. 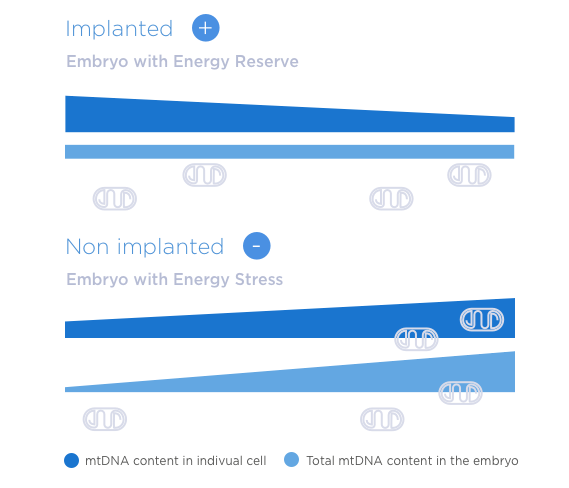 - Our studies indicate that an increase in the mitochondrial DNA in the embryo is indicative of an insucient level of energy and a low implantation potential. - The clinical translation of this work is the integration of the mtDNA copy number (MitoScore) to the routine genetic analysis performed in a PGS analysis. Measurement obtained at an early embryo stage: day 3 or blastocyst. Additional information by complementing morphological observations. Normalized mtDNA content versus nDNA.